USS Albuquerque (SSN 706) and Collins-class submarine HMAS Rankin. 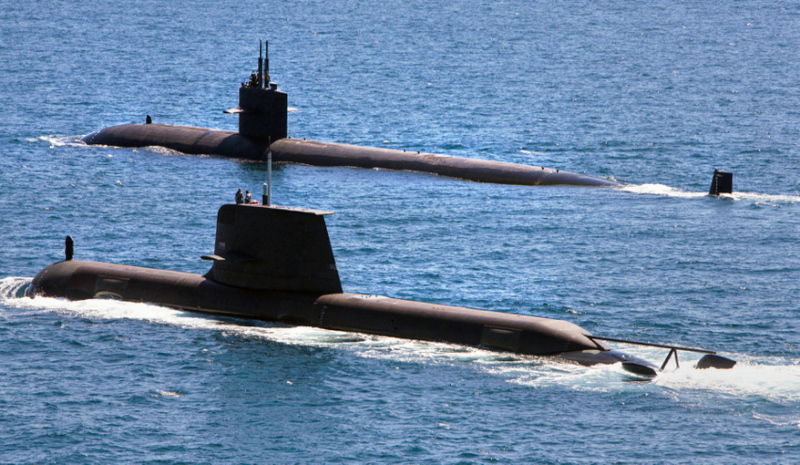 The $89 billion shipbuilding program will replace the Collins-Class submarines. The briefing will occur in Launceston on 3 May, following on from the success of the industry briefings held across regional Australia in March. Thus far the briefings have attracted over 200 attendees including manufacturers in Geelong, boat lifters in Geraldton, welders in Bunbury and engineers in Nowra. Minister for Defence Industry Christopher Pyne said the briefings are the perfect opportunity for more regional Australians to learn about the $89 billion shipbuilding project. "These briefings are a chance for regional Australians to learn more about the government’s $89 billion national shipbuilding endeavour – the most ambitious shipbuilding program Australia has ever seen," Minister Pyne said. On 31 March, Minister Pyne released the Future Frigate request for tender (RFT) to the three shortlisted designers: BAE, Fincantieri and Navantia. The RFT for the Offshore Patrol Vessels has also closed – shortlisted designers are: Damen, Fassmer and Lürssen. The shortlisted designers for both programs must demonstrate how they will transition their existing supply chains to Australian supply chains and how they will integrate local suppliers into their global supply chains. On 24 March, Minister Pyne announced the establishment of Australia’s Maritime Technical College to identify, train or retrain Australian workers for future naval shipbuilding projects. "The college will deliver skills in partnership with many existing universities and training providers across Australia, such as the Australian Maritime College in Launceston," said Minister Pyne. "This will ensure we capture the best training to help deliver the optimal naval shipbuilding skills for the future." Minister Pyne opened the first series of national capital city industry briefings in October 2016. "Throughout these briefings, Defence has met with over 1,600 Australian industry representatives from more than 1,100 Australian companies interested in doing business with Defence and assisting in the pre-construction, build or sustainment phases of the two programs," he said. Those looking to attend can register here.